To understand climate change today, we first need to know how Earth’s climate changed over the past 450 million years. Finding answers depends upon contributions from a wide range of sciences, not just the rock record uncovered by geologists. 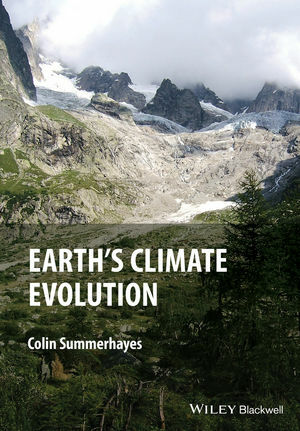 In Earth’s Climate Evolution, Colin Summerhayes analyzes reports and records of past climate change dating back to the late 18th century to uncover key patterns in the climate system. The book will transform debate and set the agenda for the next generation of thought about future climate change. The book takes a unique approach to the subject providing a description of the greenhouse and icehouse worlds of the past 450 million years since land plants emerged, ignoring major earlier glaciations like that of Snowball Earth, which occurred around 600 million years ago in a world free of land plants. It describes the evolution of thinking in palaeoclimatology and introduces the main players in the field and how their ideas were received and, in many cases, subsequently modified. It records the arguments and discussions about the merits of different ideas along the way. It also includes several notes made from the author’s own personal involvement in palaeoclimatological and palaeoceanographic studies, and from his experience of working alongside several of the major players in these fields in recent years. This book will be an invaluable reference for both undergraduate and postgraduate students taking courses in related fields and will also be of interest to historians of science and/or geology, climatology and oceanography. It should also be of interest to the wider scientific and engineering community, high school science students, policy makers, and environmental NGOs. "Outstanding in its presentation of the facts and a good read in the way that it intersperses the climate story with the author's own experiences. [This book] puts the climate story into a compelling geological history." "The book is written in very clear and concise prose, [and takes] original, enlightening, and engaging approach to talking about 'ideas' from the perspective of the scientists who promoted them." "A thrilling ride through continental drift and its consequences." "Written in a style and language which can be easily understood by laymen as well as scientists." "What makes this book particularly distinctive is how well it builds in the narrative of change in ideas over time." "This is a fascinating book and the author’s biographical approach gives it great human appeal."